This section contains the County Administrator's budget message which outlines key features of the FY2008/FY2009 biennium budget and a discussion of past and futures challenges in budgeting. The message also discusses underlying administrative practices that support the County's budget goals. This section also includes the approved budget ordinances for both years of the biennium. About the Cover: The cover was designed by Anna Henderson, an employee of the Greenville County Information Systems Division in web design/development. 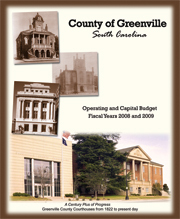 The cover focuses on the Greenville County Courthouses from 1822 to the present. Prior to 1795, courthouse proceedings took place in the home of the senior justice of the peace. In 1795, a one-story log courthouse was built on the banks of the Reedy River. In 1822, the courthouse (top picture) was built in the middle of what is today called Court Square on Greenville's Main Street. It was Greenville's most notable architectural landmark at the time. As the need grew for a new courthouse, this facility was used to house county records and also as office for the Chamber of Commerce. In 1855, a second courthouse was constructed (second picture from top) and located across Main Street from its predecessor. The 1855 courthouse was constructed in Gothic style, featuring arched windows, a tower, and corner turrets. The courtroom had space for 500 persons, which constituted about half the voting population of the county. As the county grew, the 1855 courthouse became inadequate and was torn down in 1916 to make room for the construction of a new courthouse. The 1917 courthouse (third picture from top) was in the Beaux Arts style that was popular in the early twentieth century. In 1949, the need arose once again for a larger facility; however, the 1917 courthouse was preserved. Today, this former courthouse is still regarded as the most historic public building standing on Main Street. The current courthouse (bottom right picture) was built in 1949 at the corner of East North and Church Streets. In 1997, a Judicial Wing (bottom left picture) was added and now serves as the main entrance to the courthouse. A Century Plus of Progress.